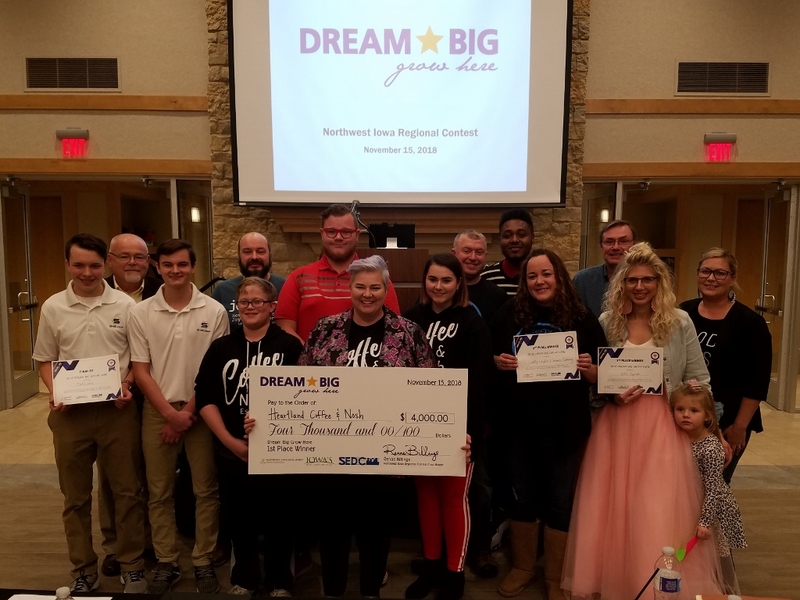 People from across the region gathered in Sheldon, Iowa on November 15th to attend the Northwest Iowa Regional Dream Big Grow Here pitch off event to determine the recipients of $7,000 in grant funds and to support entrepreneurs and small businesses throughout the region. Organizers of the competition are pleased to announce Heartland Coffee & Nosh from Correctionville as the first-place winner and recipient of $4,000. Lefty Leigh’s and Cassens’ Catering Co. from Oto was awarded second place and $2,000, and JAK Sprat from Sanborn was awarded third place and $1,000. These funds are provided to the business owners to help expand their businesses in Northwest Iowa. Heartland Coffee & Nosh is a family-owned food truck bringing specialty coffee as well as fresh and unique high-quality food to events throughout the Midwest. Heartland Coffee & Nosh Owner, Stacy Orndorff, has a goal to build Coffee & Nosh into a National Brand. Grant funds will be used to convert an old building into the company’s warehouse, purchase a walk-in cooler to store all of their product in one place, and expand their commercial kitchen. This will allow Heartland Coffee & Nosh to streamline its operations, take on larger and longer events, extend its season by three months and provide off-season catering. Long-term, Heartland Coffee & Nosh would like to offer food truck franchising opportunities. Lefty Leigh’s and Cassen’s Catering recently purchased a former church building and turned it into a restaurant and catering business focusing on homemade foods. Owners, Heath and Kari Cassens, will use the grant funds to modernize the building with new flooring, paint, furniture and fixtures. JAK Sprat is an earring company which aims to help women express their own style. Owner, Jodi Krikke, will use the grant funds to purchase a new storage system, a more efficient shipping system, and upgrade the company’s website to sell earrings online. This is the fourth year the regional Dream Big Grow Here pitch competition has been held in Northwest Iowa and is a program for entrepreneurs and small business owners to earn grant funds to start or grow their business. To participate, owners upload their entrepreneurial expansion or startup ‘dreams’ during an online portion of the program. Dream entrants then encourage friends, family, customers and other business owners to vote for them online to advance to the regional pitch off event. Dream Big Grow Here is a program of University of Northern Iowa’s Center for Business Growth and Innovation. The Northwest Iowa Regional Contest is organized and sponsored by the economic development organizations that are a part of Iowa’s West Coast Initiative, Northwest Iowa Development and Siouxland Economic Development Corporation.